Many of the people who seek alcohol addiction treatment have parents, grandparents, aunts, uncles, or siblings who’ve also struggled with alcohol abuse. However, alcoholism isn’t inherited in the same way you’d inherit blue eyes and blond hair. Addiction develops as the result of a complex interaction between genes and environmental risk factors. Personality traits: Genes linked to personality traits such as impulsivity and disinhibition are also associated with an increase in substance abuse disorders. Predisposition to mental health disorders: The same genes that are linked to depression, anxiety, and other mental health disorders are also associated with an increased risk of alcohol abuse, but this is often attributed to the tendency of people suffering from mental health disorders to try to self-medicate. Changes in how alcohol affects the body: Some gene combinations create changes in the body’s dopamine reward systems, leaving people to experience greater levels of reinforcement or reward from alcohol use and thus increasing the likelihood of problem drinking. Race: Genetic variants in people of different races have been linked to an increase in alcoholism, with Native Americans have the highest number of alcohol use severity phenotypes. Although the average person doesn’t have access to sophisticated genetic testing, you can reasonably determine your genetic risk for alcoholism by counting the number of blood relatives who also suffer from alcohol use disorders. Societal acceptance: Regularly seeing television shows, movies, and music that portray drinking as a harmless way to have fun normalize the behavior. Parental modeling: Seeing parents deal with everyday stress by becoming intoxicated sets this behavior up as normal in child’s mind. Peer pressure: Friends who encourage regular drinking promote a pattern of overindulgence. Exposure to outside trauma: Children who are exposed to verbal, physical, or sexual abuse are more likely to experiment with alcohol. Age at first drink: Multiple studies have shown that the younger you are when you take your first drink, the more difficulty you’ll have regulating your alcohol intake. These studies proved instrumental in setting the legal drinking age to 21. 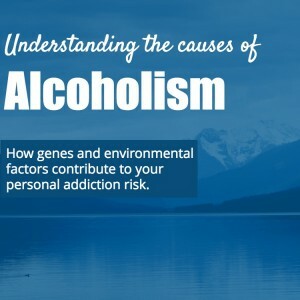 When discussing the causes of alcoholism, it’s important to keep in mind that many diseases are caused by a combination of both genetic and environmental factors. For example, someone with a parent, grandparent, or sibling who suffers from Type 2 diabetes is considered genetically predisposed to the condition. Even with this added risk, a commitment to eating a well-balanced diet and getting regular physical exercise can drastically reduce their risk of becoming diabetic. Lifestyle changes made after a diagnosis can also be beneficial, sometimes creating enough of a change in blood sugar levels to allow diabetics to reduce or discontinue their insulin all together. Receiving education on the negative effects of alcohol use: Having a full understanding of genetic risk factors and the health effects of alcohol abuse is associated with lower levels of problem drinking. Developing strong social connections to family and friends: Feeling loved and supported by the people around you makes you less likely to want to turn to alcohol for comfort. Developing positive ways to cope with stress: People who use exercise, meditation, music, art therapy, or other stress-relieving activities to handle everyday pressures are less likely to abuse alcohol. Seeking help for mental health disorders: Counseling and support from a trained mental health professional reduces the desire to self-medicate with alcohol. You can’t control your genetic makeup, but genetics alone won’t determine your fate. If you’re ready to break the cycle of addiction, help is available. St. Joseph Institute’s addiction treatment facility can address the physical, mental, emotional, and spiritual issues underlying your alcohol abuse and set you on the path to a lasting recovery.